This Amish made entertainment center combines our solid oak audio cabinet with our classic TV console for the perfect small audio-video center. The audio cabinet features 4 adjustable shelves, and a door with a 1/8” clear glass window - plenty of room for all of the toys! 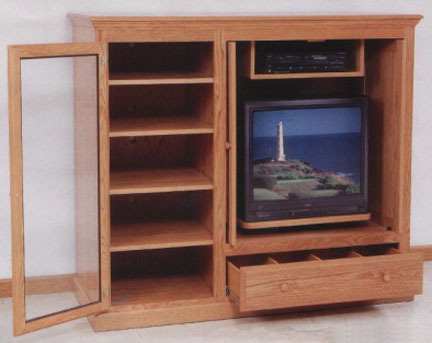 The classic TV console features a pair of pocket doors that cover both the TV and the VCR box inside, and a handy drawer on the bottom with tape dividers. The moderate 54” height makes it easy to put nick-nacks, photos, flowers, speakers or all sorts of other things on the top - within easy reach, and you can of course get it in a variety of finishes, on either solid oak or cherry, so it will blend into any home decor. This unit will be an excellent start into your Amish home furniture collection - we even have a line of bookshelves that matches this design, so you can add matching items later! 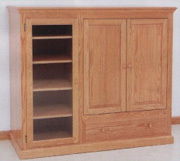 Amish made bookshelves in matching style, available in solid oak or cherry.